For being a Colorado native, I regret to say that I didn't grow up spending much time in the outdoors. My parents were busy running their business, so the opportunities to discover Colorado's greatness were far and few between. I did however grow up snowboarding and wakeboarding (neither of which took me too far out into the wild), so I poured my athletic energies there. When I was 21, I saved up $10K, graduated college and moved down to Argentina for a year. It was there that my outdoor life all began! Now, I run that small business alongside working in many facets of the mountain bike industry. I'm more passionate about the spoken wheel than almost anything else in life. The sport has sliced open my heart and soul, and allows me to live the adventurous outdoor life I never knew existed. The intense thrill of the sport, the adventures it takes me on, and community of humans around it, seize to amaze me. Biking has truly changed me life! Tell us what inspired you to discover your personal #bikelife and how has it changed you? When I was 21, I moved down to Argentina for a year, and it wasn’t until then that I truly discovered the great outdoors. When I came back to Colorado, I was quickly introduced to biking. I wish I could say it was love at first site, but it wasn’t. It look me a while to develop a love for the sport, but when I did, everything changed. Once it clicked, I became obsessed. I’ve never in my life come across something that instills such passion in me. My goal is to keep that fire alive forever. Any of the Big Mountain Enduro races. Really any of the local enduro races. The group of girls that show up every year have become like a family to me. For me, one of the best parts about racing is the incredible, like-minded humans you’re surrounded by. We ignite each other and bond through a deep mutual love. Also, the atmosphere of a race naturally pushes you to be your best - to dig deep and to push harder than you thought possible. The improvements that occur from just one day of enduro racing, might take a month otherwise. Do you have suggestions or tips for those who have not participated in an event before, but would like to? Always remember that you are racing for you and no one else. Even if you have sponsors or a specific placement goal, at the end of the day, you are doing this for YOU. So enjoy it. Do the best you can on that given day and don’t be hard on yourself if certain outcomes don’t occur. Keep it fun. After all, that’s why we do what we do, because its fun as hell! Don’t ever do anything that takes that away for you. Also, racing isn’t for everyone and you might find that, which is totally okay, but at least give it a go! You’ve got nothing to lose. Ha! Frustrated as hell. I remember thinking “This is certainly NOT my sport. Nope. Not for me. Good try Britt” Growing up, I was always naturally good at sports. So when I hopped on my first mountain bike at 23 and was terrible, my reaction was to hate it. But, I also hate giving up… so I kept pushing. And as all things in life, the better you are at something or the more you know about something, the better it becomes. Well when I first started, there was always nervousness. EVERYTHING seemed so challenging and nearly impossible. But then I learned to celebrate the small successes, recognizing that one day the small successes would add up and lead to big ones. And they have. I hold onto that mindset to this day. If something makes me so nervous that I have to stop and contemplate for too long, I have to remind myself of the day’s other successes and tell myself it’s okay to walk it. Leave it to be conquered another day, but it’s important to come back and do just that! Clips or flats? What works for you and why? Clips! I personally feel they’re more efficient. And they push me when I least expect it. I might be doing a technical uphill section, and midway through I want to put a foot down and give up, but being clipped in keeps me going. It’s often disastrous trying to unclip in the middle of a tech section and come out gracefully, so instead, I dig deep and push through it. In other words, with clips, I’m less likely to give up and put a foot down ;) With that said, I think it’s important to learn on flats. You need to learn proper bike handling skills (weighting the bike, jumping, bunny hopping) without having the cheat factor of clips. Ha, far too many to pick one in particular. That’s sort of the nature of the sport. The most important thing I’ve realized is to not let the failures and crashes eat at me emotionally. You can’t help what they do to you physically, but attitude is everything in life, so always find the positive. You tried! Sometimes that’s enough. Crashes and failures are bound to happen, they’re a part of the sport, it’s how you learn from them that shapes you as a rider. Looking ahead. It was one of those things I knew I was supposed to do, but was always too focused on what’s right in front of me. It hampered my riding a lot and I didn’t realize it until I started to practice it. My suggestion, start from the get go. Remind yourself every few minutes on the trail to look ahead, even on the uphill. Have it be a part of your pedaling mantra. Cornering. I think it’s a skill that all riders are constantly trying to get better and better at - how to corner quickly, smoothly, and effectively. I try and practice as much as possible on the DH mountains, pump track, and cones in the parking lot. I don’t let it drag me down. I tell myself that I’m doing my best, and if I brake too much on one corner, it’s more incentive to nail the next one. Everything. Literally everything. But mostly the fact that getting on my bike allows me to explore the outdoors in a way where adrenaline and mediation are beautifully fused together. I’ve never experienced anything else in life quite like it. I have a dirt jumper, a road/town bike and my mountain bike. 97% of the time I’m on my mountain bike, which is a Yeti SB5C. I chose it because it’s the best all around bike for the daily Colorado grunting climbs, and my weekend enduro races. The bike can do it all! Mountain biking has changed my life in such an enormous and positively impactful way. I found a passion in it that I’ve never found elsewhere. Naturally I want to share that passion. I want as many people as possible to have the spoken wheel ignite their hearts and souls the way it has for me. Coaching is one of the best opportunities to share, ignite, and grow that passion with the world. Why did you partner with VIDA and what would you like folks to know about the VIDA MTB organization? Because I believe they’re the best at what they do. I haven’t had the opportunity to explore many other female specific clinics, but I do know that the community behind VIDA in unlike any I’ve ever seen. The community is so full of love. Everyone wants the best for everyone else and we push each other in such a beautiful way! 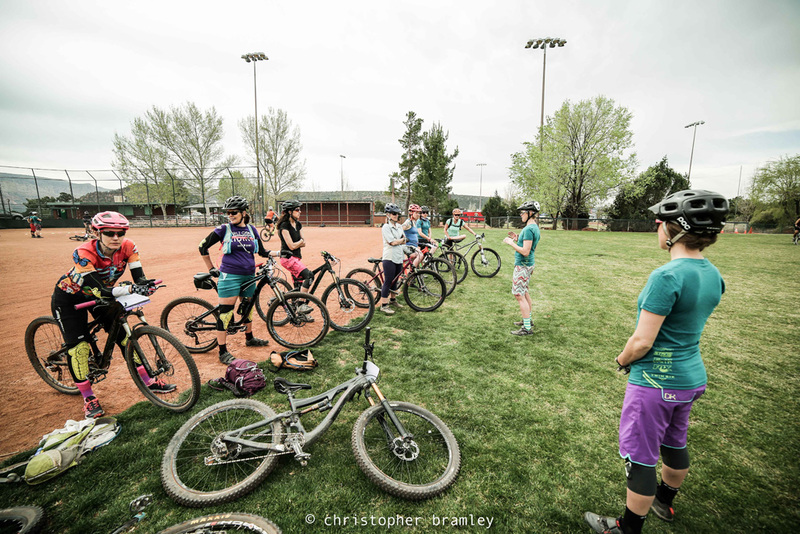 Why do you feel skills clinics are important for those new or seasoned in riding? They’re HUGELY important! Whether you’re new or seasoned, you always walk away with gems to work on that will change your riding for the better. New discoveries that you hadn’t heard or thought of before. Whether you’re a newbie looking to get the basic bike handling skills down, or a vet looking to jump bigger, VIDA offers it all. It’s a loving and encouraging atmosphere to push yourself within your comfort zone. The people. Everyone has this deep rooted passion for the same thing which is a powerfully connecting piece no matter how different you might be otherwise. Generally everyone in the industry has similar values, ideals and ways of life, which is a cool thing to share. 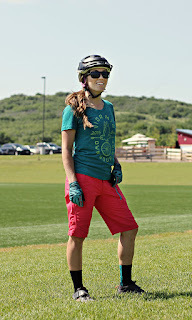 I’m on the board of directors for the Colorado Mountain Biking Association, which (if you’ve ever been on a board, you’ll know) entails SO MANY things. Our main role is to advocate for mountain bikers and mtb trails in the Denver/Golden area and beyond. To make that happen, we’re involved in so many things; community, events, trail building, awareness, education, advocacy, etc. 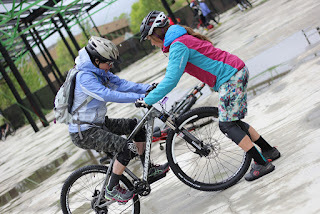 Why do you feel it is vital for women to be involved with their local trail group? I think women participate in sports in a much different way than men. Surrounding yourself by strong women, is generally a much more comfortable atmosphere to push yourself and improve. Also, the comradery of women cycling groups is an extremely beneficial component to the cycling life. I think a lot of women shy away from it because it’s “dangerous.” It’s true that the crashes can be brutal, but it’s also true that you can easily choose to stay within your own comfort zone that doesn’t ever allow for crashing. Start within you zone, and gradually push yourself more and more. Don’t be afraid of the potential crashing! We all fall in life (whether we bike or not)… it’s all about how you pick yourself up! More local women’s groups, opportunities, events, etc. We need more entities (whether it’s bike retailers, manufacturers, organizations or entrepreneurs) specifically supporting the women’s scene. As a whole, we need to put more and more energy into that sector of the sport. 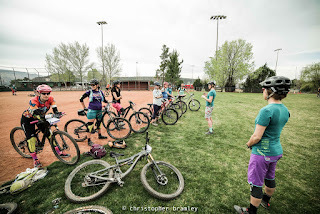 See “tell us what inspired you to get involved with coaching.” I’ve found such a deep passion and love through mountain biking, and I want as many women as possible to experience that too. The world would be a better place if we all had something so healthy and vibrant that we were passionate about! I’m terrified of heights. The shaky knees and sweating palms, kind of terrified. Harness or not, I’m horrified!